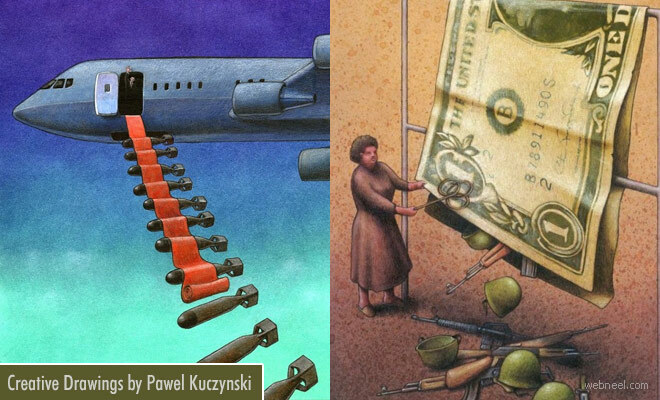 Creative Drawing : Pawel Kuczynski is a Polish artist who loves creating Satirical drawings. He is a graduate from the Academy of Fine Arts in Poznan with a degree in graphics. He has been working on satirical drawing since 2004 and he has received more than 102 awards and distinctions for the creative drawings. According to his website,"In 2005 I received the "Eryk" award from the Association of Polish Caricature Artists, for the discovery of the year confirmed by the record number of awards in international competitions". If you like his creative drawings you can also purchase them online either in framed prints or rolled canvas.